Contains the premium active ingredient Bromethalin, excellent for proven control of high rodent populations and severe infestations. Bromethalin is an acute, non-anticoagulant active that will begin to kill rats & mice in 2 or more days, faster than anticoagulant baits. Kills by affecting the rodents’ nervous system – Bromethalin is an ATP Inhibitor, which prevents the transfer of energy across nerve cells. Due to a quick knockdown when compared to anticoagulants, more rodents can be controlled with less bait. 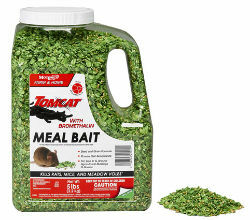 Tomcat with Bromethalin Bait is an exclusive oat & grain formula designed for maximum palatability and is ideal for use when competing food sources are available. Meal Bait is excellent for clean out, indoor baiting (when animals aren’t present), or burrow baiting, including rat burrows beyond 100 ft of buildings.